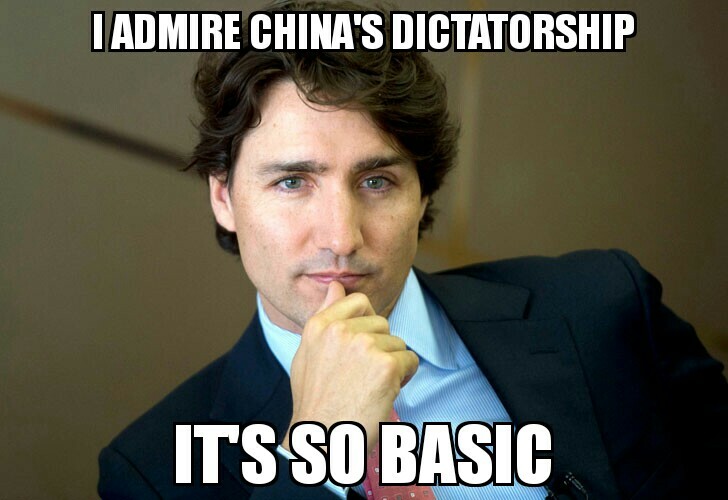 Justin Trudeau has a “Basic Dictatorship” Problem. Ultimately, it stems from his political Romanticism and his attempt to deny that politics is, by definition, divisive precisely because we are free to express our disagreements with one another and with the government of the day. To borrow his infamous phrasing from 2013, Trudeau has expressed a disturbing and obsequious admiration for both China’s “basic dictatorship” and now to Cuba and its “longest-serving president,” Fidel Castro, who died on 25 November 2016. Trudeau talks of China’s command-and-control economy’s turn toward sustainable energy sources as if this virtue-signalling alone somehow absolves China of decades of Communist atrocities. Finally, Trudeau ends his comment with a rhetorical flourish on how Stephen Harper, when he was prime minister, must have fantasized about wielding the immense power of the Chinese president, thereby defecting some attention and responsibility away from his own self-described “admiration” for dictatorship. Indeed, Stephen Harper was such a dictator that Justin Trudeau’s Liberals defeated his Conservatives in a free and fair election which saw Harper’s resignation and an orderly transition of power between the Harper Ministry and the Trudeau Ministry on 4 November 2015. With respect, that was not the point that Trudeau was making. Trudeau did not merely describe how an authoritarian state operates, controls industry, interferes in the economy, and suppresses the political freedoms and civil rights of its people; instead, he clearly expressed his personal “admiration” for a “basic dictatorship” and therefore judged that authoritarian regimes are superior to liberal democracies, at least on the issue of sustainable energy. The Trudeaus’ adoration and adulation of Cuba goes back decades. In this interview of Margaret Trudeau, which looks like it must have aired in the late 1970s or early 1980s, she describes from 3:15 to 6:06 Fidel Castro in an almost hagiographical way. She lavishes Castro with great praise and paints him as a sort of gallant, chivalric hero, one of those rare great men who was also a good man because he practised egalitarianism around the dinner table by including her and her nanny in the political discussion and statecraft that he held with Pierre Trudeau. The real gem of this conversation occurs at 5:50. The host asks Margaret Trudeau if Fidel Castro allowed her to participate in discussions. “Yes,” she affirmed. Sadly, the perverse irony that Fidel Castro himself contributed so significantly to making the world more unfree was lost on both Margaret Trudeau and the interviewer. Finally, A. Trudeau glossed over the Castro regime’s various atrocities and human rights violations and even dismissed exiled Cubans’ (because Cubans in Cuba would be thrown in prison for saying such things!) political criticism of Castro in paternalistic terms as a puerile, adolescent rebellion against one’s parents. Indeed, irony is often lost on the Trudeaus. Fidel Castro overthrew Batista through his brilliance and revolutionary prowess in order to build a “more perfect social order” — but anyone else who opposes or rebels against Fidel the Great must be swatted down and dismissed as a petulant child. Utopians believe in the right of might over the rule of law and worship power above all. Finally, by pure coincidence, Prime Minister Justin Trudeau visited Cuba on an official visit just last week. 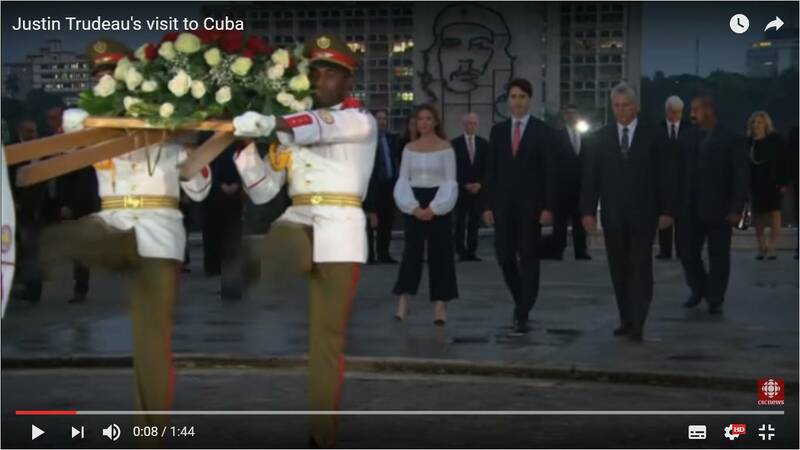 The imagery in the CBC’s news video perfectly sums up Castro’s Cuba and the Trudeaus’ bizarre decades-long adoration to it: the Cuban honour guard goose-steps out of frame to reveal a solemn-looking Justin Trudeau with hagiography of Che Guevara — another psychopathic revolutionary romanticized by first-year left-wing undergraduates — looming over them all in the background. 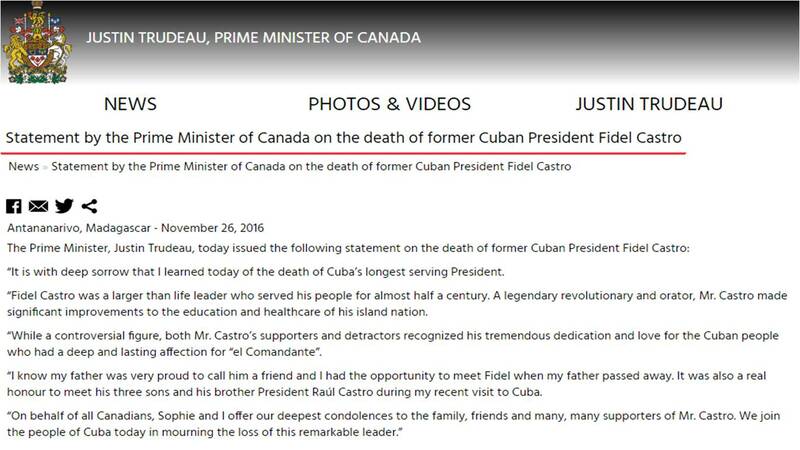 In light of Fidel Castro’s death, Trudeau has eulogizes him in mendacious euphemism as a “legendary revolutionary and orator” instead of confronting Castro’s brutal legacy: like all Communists dictators, he imposed his utopia by wading through a sea of blood, jailing and murdering political opponents, and then maintained his dictatorship through authoritarian repression of free markets and free elections. Trudeau uses mendacious euphemism to gloss over Communist dictatorship, referring to Castro as “Cuba’s longest-serving president” and, in a statement that sounds like a joke, Trudeau deigns to acknowledge Castro as a “controversial figure” — as if his record were merely a matter of polite disagreement amongst policy wonks. Trudeau even throws in a welfare nationalist line about healthcare and education in a pathetic attempt to underline shared policies between Canada and Cuba, as if the means by which those policies were achieved justified their results and made them morally equal. Perhaps we should add, the Castros provided good education and healthcare to all those Cubans whom they hadn’t already cruelly murdered or arbitrarily detained or permanently exiled. Cubans expressed a “deep and lasting affection for ‘el Commadante'” because they had no choice in the matter. Overall, Justin Trudeau fell for the Potemkin Village routine that all dictators put on for visiting foreign dignitaries. The Castros have murdered and arbitrarily imprisoned their political opponents for decades. In Cuba, the Castros have stamped out and brutally repressed the rule of law, liberty, and representative and responsible government. There is no due process. There is no habeus corpus. There is no freedom of expression. There is no freedom of movement. There are no free markets. There are no political parties, and there are no free and fair elections. In short, Cuba’s basic dictatorship outlaws and criminalizes all that which the Canadian Charter of Rights and Freedoms upholds and guarantees for Canadians. “I, uh, have a personal recollection of, uh, uh, the reaction, uh, when, uh, a, uh, long-time political figure of a particular country passes away, uh, however, uh, polarizing, uh, they may have been, uh, for certain people. Uh, I made a statement that recognized, uh, the close connection — the long-standing connection — between, uh, Canada and Cuba. Again, with due respect to the prime minister, Fidel Castro was not merely a conventional “polarizing” politician with whom Cubans were free to openly disagree with and vote out of office, like the politicians whom we normally describe as “polarizing” in liberal democracies. Castro had a “deep and lasting impact on the Cuban people” because he repressed them and denied them civil rights and political freedoms. There were not merely mild “concerns around human rights” — the Castro regime has violated human rights for six decades. And Justin Trudeau ends his comments with a deflection, similar to that which he offered in 2013.” For we must all understand that Trudeau has been “open about” the “concerns around human rights” in Cuba, and we are mistaken and misguided in our criticism of Trudeau’s admiration for a dictator. We just wouldn’t understand. Trudeau simply lacks the courage of his convictions and can’t take responsibility for his own statements, nor for the consequences of his statements. In general, I’ve noticed over the last three years that Justin Trudeau demonstrates a disturbing naiveté about the nature of dictatorships. His comments from 2013 praising China’s “basic dictatorship” remind me of the sort of facile assertions that I heard as a Teaching Assistant from first-year undergraduates — almost always a young man aged 18 to 21 — who think that command-and-control dictatorships are inherently superior to and more efficient in distributing resources than capitalistic liberal democracies. Other former TAs might recognize this trope. I found that these students normally divided along two lines: one, the slightly irreverent young man with a devil-may-care attitude and looking to score laughs and show off his own ability to play the part of contrarian and good debater, and the other, more sinister character who genuinely believes it and might be actively monitored by CSIS. Since becoming Prime Minister, Justin Trudeau has consistently demonstrated that he either does not understand or deliberately obscures the difference between the executive and the legislature. Trudeau frequently presumes to speak “on behalf of all Canadians,” as he did in that press release about Fidel Castro’s death, and he has taken to asserting that “Canada is back” — the implication being that only the Liberals can legitimately represent Canada as a whole and the True Canada, and that Conservatives and New Democrats and all other parties are unpatriotic and do not represent True Canada. Furthermore, that latter implication contains a certain irony and contradiction of its own, given that Trudeau has also described Canada as a “post-national” state, which makes patriotism itself untenable. In our parliamentary system, the Prime Minister and Cabinet represent Canada as a State and as an international legal person (as in le pays), and they govern in a way that should promote Canada’s national interest; however, the Prime Minister and Cabinet most certainly cannot “represent all Canadians” in the sense of “reflecting their values in government.” The Sovereign and Governor General represent Canada in the sense of la patrie. At the Liberal event in 2013 where Trudeau expressed admiration for Chinese dictatorship, he also praised the “consensus government” that pertains in the Northwest Territories and Nunavut. And, for the record, Trudeau is essentially right in his description of how consensus government works, but he was wrong about Yukon, which in fact has operated under standard responsible government with competing political parties since 1978. Only the Northwest Territories and Nunavut in fact operate under consensus government. Not surprisingly, this comment received less attention that his self-described admiration for China’s dictatorship, but the two comments are not as tangential as they might first appear. The only difference between consensus government and an authoritarian regime is whether the threat of force and coercion are necessary to mandating, manufacturing, and maintaining that consensus. In small communities, a genuine consensus can emerge legitimately and peacefully. But this is impossible in a large State. In particular, “The Trudeau and Sinclair families; his roots in East and West, French and English” evokes the Tudors, with their rose both red and white, with roots in the Houses of Lancaster and York, in the North and in the South. In short, “romantics shrink from the adversarial politics of the parliamentary system.”[ 6] Trudeau himself frequently laments “divisiveness” and the “politics of division.” But, as the late Christopher Hitchens so aptly observed, “politics is division by definition,” because in a liberal-democratic society, we are free to express disagreements, and because our parliamentary system itself legitimates opposition and adversarialism in order to maintain the accountability of the government. In short, politics by nature is and should be divisive. Without the disagreement and dissent that comes from persons who sincerely hold opposing views and beliefs, politics would cease to exist altogether. Janet Ajzenstat, “Bicameralism and Canada’s Founders: The Origins of the Canadian Senate,” in Protecting Canadian Democracy: The Senate You Never Knew, ed. Serge Joyal (Toronto: University of Toronto Press, 2003): 3, 7. Janet Ajzenstat, The Once and Future Canadian Democracy: An Essay in Political Thought (McGill-Queen’s University Press, 2003), 8, 9. Christopher Hitchens, “Are Alternative Newspapers Doing Their Jobs?” Address to the Association of Alternative Newsweeklies, 12 June 1998 at 31:29. This entry was posted in Dorchester Review, Loyal Opposition. Bookmark the permalink. An absolutely excellent article James! Congratulations. I personally think it’s a waste of time to offer an intellectual critique of Justin’s annunciations which are the product of the capricious vicissitudes of Justin’s illogical brain. He and Alexandre are ‘ champagne socialist hypocrites’ who have no concept whatsoever of what it is to be an average citizen. I didn’t know that Alexandre is this dumb. He and Justin would be ne’er-do-wells if they had not been born rich. I imagine that they’re not aware that Fidel Castro wanted Nikita Khrushchev to start a Nuclear War during the Cuban Missile Crisis. Castro told Khrushchev that he was willing to sacrifice Cuba to nuclear annihilation for the cause of socialism! stopped Quebecois Separatists in his day and preserved Macdonald Federalism through to the defeat of the 1992 Charlottetown Accord. I personally now label ‘Macdonald Federalism’ as ‘Macdonald – Trudeau Federalism’ since Pierre Trudeau is exclusively responsible for preserving Macdonald’s federal structure of Canada as ‘one country’ rather than an American-style federation. Every other politician in Canada from the 1960s to the 1990s — including Jean Chretien — would have thrown Macdonald federalism into the garbage in a frivolous futile attempt to appease Quebecois Nationalists & Separatists. Pierre Trudeau was single-handedly responsible for the failure of the Meech Lake & Charlottetown Accords by turning public opinion against them. Pierre Trudeau is our second-greatest Prime Minister after Sir John A. That said and done, I was never pleased with Pierre Trudeau’s soft-on-crime / soft-on-dictatorship / soft-on-communism disposition, but nobody is perfect. This is in reality the disposition of liberals in general — including Barack Obama — which is why only young people can be fooled into believing what Liberals promise. Liberals are the worst hypocrites in society. P. S. Are you as outraged and furious as I am over this Liberal Government demoting Sirs John A. Macdonald & Wilfrid Laurier down to the $100 & $50 Dollar Bills, and ripping off First World War Prime Minister Sir Robert Borden? The First World War of course means nothing to Liberals! Viola Desmond is a notable citizen of history, but she is not more important than any Prime Minister. Her effigy can easily be placed on the obverse side of the $10 Bill which would be quite an honour. Patriots need to speak out in opposition to this change. The biggest reason to hate Liberals is their contempt for heritage. I quite enjoyed your detailed article about Justin Trudeau’s “basic dictatorship problem”. You brought together different threads to explain our PM’s curious and puerile romanticism, or what might be called the “Imagine” philosophy of politics (after the John Lennon song). Many felt the same way, clearly, and the Twitter storm of mocking “Trudeaueulogies” was amply deserved. It hopefully marks the beginning of the end of Trudeau2mania. I suspect that Mr. Trudeau, with his high self-regard, easily writes himself into any current event even if — as with Mr. Castro — it requires alteration of the historical record. Watch for more gaffes of this type. “the immense power of the Chinese president, thereby defecting …” should be “deflecting” I believe. “In light of Fidel Castro’s death, Trudeau has eulogizes him in mendacious euphemism” (should be “eulogized”).